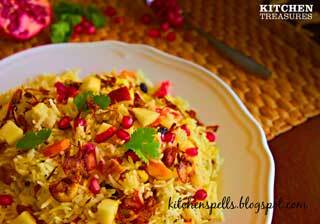 Kashmiri Pulao can be made easily with this recipe. Try it today at your home. Wash and soak the Basmati Rice in water and soak the saffron strands in 1/4 cup of warm milk for 15 minutes. Heat a skillet and add 2 tbsp of ghee to this. Add roughly chopped almonds, cashew nuts and walnuts to this and sauté it till the colour of the cashew begins to change. Transfer this to a tissue paper to drain off the excess oil. Add raisins to the ghee and sauté it till it fluffs up. Drain off the excess oil and keep it aside. Thinly chop the onion and fry it in the ghee till the colour changes to brown. Keep this aside for the garnish later. Add the whole spices listed into the ghee and saute on medium flame for 1 minute. Add chopped ginger along with mint leaves and saute till the raw smell goes away. Toss in the Basmati Rice and once it heats up, pour water, the saffron soaked milk and the remaining milk to this along with salt. Keep on medium flame and covered till cooked. Fork the rice to prevent it lumping. In the meantime chop the carrots and paneer, in a separate skillet saute this till cooked. Add this to the rice along with the dry fruits and mix on low flame ensuring that the rice doesn’t get mushy. Switch off the flame and add the pomegranates and apples( you may use pineapples also). 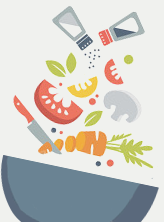 Do not cook once the fresh fruits are added. Garnish with the fried onions and serve it along with raita.